Automotive Part Cleaners & Degreasers Market size is set to surpass USD 47.5 billion by 2024; according to a new research report by Global Market Insights, Inc.
High performance & low emission engine demand and rising importance of servicing & maintenance operations should promote automotive part cleaners & degreasers market growth. These products promote removal of engine contaminants prior to oil change which improves fuel efficiency. There is an increasing trend for online sale of automotive part & repair accessories to enhance the performance and efficiency of engines. Rising heavy and commercial vehicle demand owing to booming construction and e-commerce industries are expected to further increase automotive part cleaners and degreasers market demand. U.S. engine flush cleaner market should witness gains of about 2.5% by 2024. These products impart engine longevity, efficiency and clean lubrication system which enhances vehicle performance. They remove varnish, gum and deposits from various engines in passenger cars, light & heavy-duty vehicles and two wheelers thereby improving vehicle lifespan and fuel performance. Rise of average vehicle age and stringent regulations to reduce VOC emissions should boost growth of automotive part cleaners’ market. Catalytic converter cleaner market size was valued at over USD 2.5 billion in 2017. These products exhibit various benefits such as fuel efficiency improvement, safety measure, and reduced VOC emissions. They help prevent clogging of catalytic converters which can worsen performance, produce harmful air emissions and lead to poor mileage. Rising government regulations pertaining to emissions and investments made by automobile manufacturers in R&D activities to reduce emissions are likely to stimulate automotive part cleaners and degreasers market growth. China transmission degreaser market size is estimated to exceed USD 1 billion by 2024 pertaining to rising purchasing power and standard of living. This product breaks down varnish deposits and cleans internal transmission components to prevent damage and ensure passenger safety. They improve vehicle speed and maintain optimal gearbox condition. Increasing demand for vehicle longevity, performance, leakage elimination and periodic servicing should accelerate automotive part cleaners and degreasers market growth. 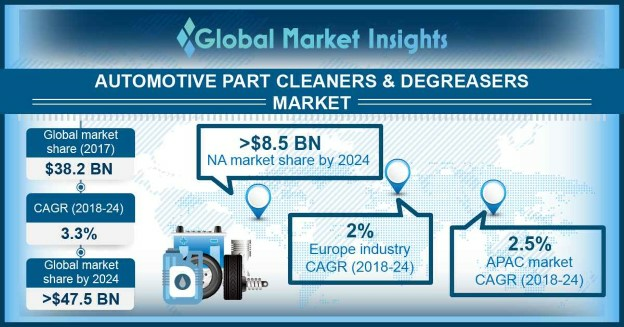 Global automotive part cleaners & degreasers market from HCV’s may register growth at over 2.5% by the end of forecast period. Government initiatives to invest in road construction, commercial and & non- commercial projects, and travel & tourism sector have increased the demand of for heavy commercial vehicles for the transportation of raw materials, thereby enhancing product demand. Global automotive part cleaners market share is consolidated and less competitive with the key manufacturers being BASF, 3M Company, DowDupont, WD-40 and Valvoline Inc. Other manufacturers include Wurth USA, GUNK, Bardahl Manufacturing Corporation, and Engen Petroleum Ltd. Various manufacturers are indulging in strategic acquisitions to foster regional presence and improve product offering. Companies are engaging in strategic collaborations to develop innovative products and expand production range which should accelerate automotive part cleaners market growth.